What's the most cost effective way to buy bulk LEGO bricks? I've found a couple places to pick up bulk LEGO, but they all have various issues. Bricklink - I found their user interface confusing, clunky, and straight out of 1998. I'm aware of a couple of other questions here discussing alternatives to Bricklink and ways to optimize Bricklink shipping costs. eBay - Fine for most things, but doesn't work when you need a specific brick in a specific color. Pick a Brick - They don't have ALL the bricks available. Does anyone have a more effective and efficient way to buy bricks? First off, as you mentioned, Ebay is not the greatest place on the net to get bricks. As you seem to be aware of, it is difficult to get individual bricks from these individual sellers. Having to pay separate shipping from various buyers plus the unreasonable prices can really add up. Then there's LEGO Shop. Here, you can buy LEGO bricks directly from the LEGO company. You can individually purchase bricks from Pick-A-Brick, or buy their currently advertised sets. The downside to this is that they obviously do not carry discontinued sets, the selection in Pick-A-Brick is limited, and the prices are unsatisfyingly high, making the bucks add up quickly. Shipping times can be pretty quick and cheap, that is, if they're not currently having any difficulties with their warehouse. If they are, then orders can be delayed by a large amount of time, which has happened to me twice. I once placed an order there which took nearly two months to arrive. Then, there's Bricklink. You seem to be aware of this website. I like it very much. It is, in many people's opinions, the best source from which to acquire LEGO bricks. The prices are cheap, it carries almost every piece and set ever released, (even discontinued ones) the tools for finding bricks are useful, and most of the people there are pretty nice. The interface is quite useful, you just have to be familiar with it. Once you get used to it, I'm sure it won't seem so "clunky" to you. For detailed help, enter the chat room. The people there are very nice, and will be happy to you point you in the right direction. Shipping times vary depending on which area you buy from. Buying from within your country might generate shipping the speed of TLG on their best days. Bricklink, however, is much less likely to have technical difficulties as each order is just an individual seller sending something off to the post office, and has therefore generally been more reliable in my experience. If you contact your closest LEGO store, they can sell you a 'case' of bricks for about $70, which will give you, I'm told, about 650 2x4 bricks, which is about $0.11 per brick. These are bricks that usually go into the pick-a-brick wall. You might be able to buy case by just walking into the store, but expect the manager to have to order the bricks, with a 4 week lead time. I feel this approach is a nice complement to bricklink.com. Bricklink really is the best place to get bricks you are looking for. It works really well once you get the hang of it. It also makes it pretty easy to find pieces you are looking for... if you know what it's called or how to describe it. The hardest thing to get used to is what parts are called. So my suggestion is to find a seller with a large inventory, and just peruse it and figure out where parts of different types are located and what they're called on Bricklink. Alternatively, you can browse to a set you are familiar with and look at the set inventory to learn what Bricklink calls those parts. Make sure you use the Wanted List feature. This is one of the most important part of BrickLink and a lot of new users completely miss it. You can have one main Wanted List as well as additional Wanted Lists for your various projects. Once you add items to your wanted list from the main Catalog (you can add sets, parts, sticker-sheets, minifigs - anything in the Catalog), you can check which seller carries all or at least most of the items you want. You can also narrow down your search by color, price, country, new/used, etc. It is really the most useful feature of BrickLink that will save you lots of time and money as you are shopping around. Also, pay attention to the sellers' feedback and terms. After you shop for a few months, you will see how incredible BL and the BL community are. BL is really a LEGO fan's dream. Sets from the Classic line tend to have a good value in terms of cost per brick. The trade-off is that you don't get a large model to build in many advanced pieces. Brickowl.com is another Bricklink-style site with an updated interface and easier shopping experience that you should check out. The interface is well designed and they have a feature built-in that allows you to find the best combo of stores for the parts in your wishlist, then add them all to your cart at once. It even gives you a total + shipping! Bulk lots of around 4-5 pounds often sell for around $7-8 per pound (or less), including shipping. I buy many of these lots, which I count and sort, and the average cost-per-piece has been about 2.5 cents. If you are an eBay seller, you can relist the parts you don't want to keep. If a lot yields some scarce or desirable pieces you can sometimes even make your money back or clear a profit. This does require some time and knowledge about LEGO parts, and the ability to spot good lots from the sometimes blurry eBay photos. Although many common parts sell for 1 or 2 cents each on Bricklink, the more desirable parts and colors are anywhere from 5 cents up to several dollars each - plus shipping. On average, you will pay less per piece with bulk lots from eBay. I have been able to make a small cash profit selling parts from bulk lots and have added about 15,000 pieces to my collection. Not the most efficient method, perhaps, but for cost-effectiveness you can't beat free. I built a page to locate good deals on bulk LEGO by filtering through eBay results using a custom algorithm. As others have said, eBay can be a cost effective way to pick up bulk bricks. 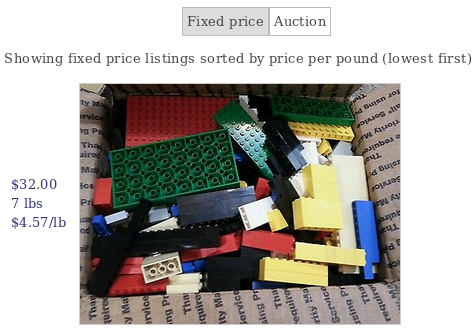 Unfortunately, it can be tedious to weed through the expensive or spammy items to find just the bulk LEGO. This web app takes some of this work away by calculating price per pound and sorting results by best value. Bricklink. I'd like to add that using software (MLcad, LeoCad, Bricksmith) to build the model or just compile a list of pieces you need there. Open it up in a program called BrickStore and you can then export directly out to your wanted list. This is very handy when using Bricklink. You can even look at price averages in the program and jump straight to other stores selling selected parts ! Also don't worry the 'New' Bricklink will look alot easier on the eyes. I don't know where you live, but if you live near a Walmart, visit as often as you can starting about 3 weeks before Xmas. Lego sells their huge creative series parts boxes, 1600 pieces, for about $30 US. Mega Blocks also discounts their equivalent by half. The Lego boxes never last 2 days, regardless of how much they have in stock, Walmart sells out. It takes about a week for them to sell out of the Mega Blocks. Last Xmas I only bought 4 of the Lego, this Xmas I'll buy 10. Of course I'm assuming Lego will do it again. In each official lego store there is a wall with shelves of lego bricks. You can fill a small or large cup there. Now matter how you fill the cup, it's a fixed price per cup. Obviously the selection will be limited, but if you happen to have use for the provided bricks, it's often the most cost-effective way to get bricks. This is provided that you stack the bricks efficiently (this can save up to 50%). I know several people who spend entire afternoons filling cups there, the store employees don't seem to mind. Not the answer you're looking for? Browse other questions tagged shopping or ask your own question. Where can I get a large number of LEGO bricks cheap? Any good alternatives to BrickLink? Where can I get 'classic' Lego heads from? How can I minimize the number of merchants for given set of requested bricks? Average price per weight of new bricks in sets purchased for retail price? Is it possible to buy a bulk of 1000s of basic bricks (mostly 2x4)? Is there any way to buy specific duplo blocks from Lego (pick-a-brick style and/or in bulk)? What's an effective strategy for purchasing large numbers of different bricks? Is there a good way to buy molded LEGO boxes? What is the most cost effective way to get basic bricks in bulk? What is the best way to buy bulk bricks ONLY?